Understand Distributed Operating Systems. what it means? 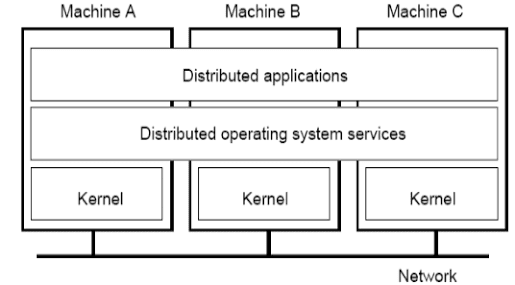 Distributed Operating System is a model where distributed applications are running on multiple computers linked by communications. A distributed operating system is an extension of the network operating system that supports higher levels of communication and integration of the machines on the network. Also Read : Understand Cyber Security. This system looks to its users like an ordinary centralized operating system but runs on multiple, independent central processing units (CPUs). These systems are referred as loosely coupled systems where each processor has its own local memory and processors communicate with one another through various communication lines, such as high speed buses or telephone lines. By loosely coupled systems, we mean that such computers possess no hardware connections at the CPU - memory bus level, but are connected by external interfaces that run under the control of software. Recommended : Top Grossing movies of 2018. Server Systems can be broadly categorized as: Compute Servers and File Servers. Compute Server systems, provide an interface to which clients can send requests to perform an action, in response to which they execute the action and send back results to the client. File Server systems, provide a file-system interface where clients can create, update, read, and delete files. The growth of computer networks - especially the Internet and World Wide Web (WWW) – has had a profound influence on the recent development of operating systems. When PCs were introduced in the 1970s, they were designed for personal use and were generally considered standalone computers. With the beginning of widespread public use of the Internet in the 1990s for electronic mail and FTP, many PCs became connected to computer networks. In contrast to the Tightly Coupled systems, the computer networks used in these applications consist of a collection of processors that do not share memory or a clock. Instead, each processor has its own local memory. The processors communicate with one another through various communication lines, such as high-speed buses or telephone lines. These systems are usually referred to as loosely coupled systems ( or distributed systems).